In addition, with a digital display attached to your scoreboard, these message centers allow for ad space which gives you more opportunities to increase sponsorship and ad revenue with virtually limitless ad space. Contact Toadvine for more information on enhancing the fan experience with message centers. 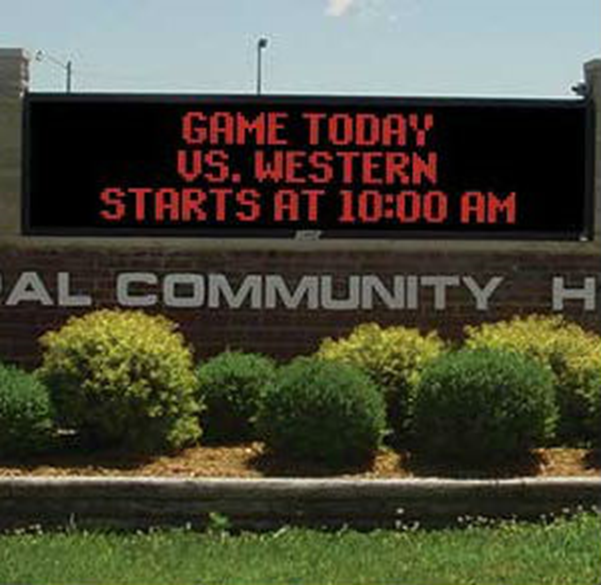 Nevco uses the same LED scoreboard technology to manufacture electronic marquees. You might have also heard these called digital displays, LED signs, electronic signs, or reader boards. 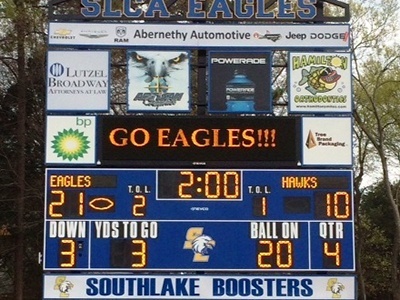 Like Nevco's scoreboards, electronic marquees are designed with high-quality LED technology built to last for approximately 100,000 hours, which reduces energy costs and requires little to no maintenance. We offer many types of electronic marquees to best fit your needs. Single sided and double sided; full color and monochrome; with 20mm and 16 mm pixels. Toadvine will work with you to understand your goals and help you decide which option will maximize your impact with your audience.